There are numerous natural cures for anemia. Once the cause of the anemia is corrected, restoring the bodies ability to make blood is a simple process. While there are several options that can help, to some extent, it is possible to pick and choose any or all of the following. Who Am I to Provide Anemia Help? As a holistic nurse and certified in bloodless medicine and surgery, my experience comes from treating thousands of people in and out of the hospital over two decades. Because I am an expert in the field, doctors have consulted with me both in the US and in several other countries on how to best increase blood counts in order to avoid blood transfusions. Some come to me privately when the health care system could not solve their anemia challenge using conventional medical treatments. The following is the updated information that is used in hospitals and in my private practice today. In all of these, to date, not one of those I have consulted on or coached has died as a result of complications from anemia. The lowest count was Hgb 2.9, coming up to 3.9 in less than 24 hours. While the science suggests it takes 2 weeks to make new blood, how this is possible is explained by how the body shunts blood until new blood is in the making. There are many parts to our blood and there is a simple anemia natural treatment to correct the low count. There are two parts to the natural cures for anemia. One involves correcting what is causing the anemia and the other involves increasing the blood count. The following protocol does both at the same time. These are the parts that make up our blood. The white blood cells can be broken down into even more specific types. When we have anemia, something is causing these to not be produced or for some reason there is a loss of these faster than our body can make them. The plasma is made up of water and salts absorbed through our digestive system. Within the center of our large bones, in the marrow, our body makes stem cells. Think of these as cell wann-be's. They don't know what they want to be but they have potential. When the appropriate hormone is sent out, depending on the need of the body, the stem cells differentiate or turn into what ever the hormone tells them to be. They could turn into red cells, white cells or platelets. The hormone that tells them to become red blood cells is erythropoietin. The red blood cells have a life expectancy of about 120 days. Once a red blood cell has lived its life to the full, it gets recycled by the spleen. The iron is made into new red blood cells. White blood cells live for about 13 days. When they die, the other white blood cells absorb the pieces. And when there are not enough white blood cells, the body releases interlukins and colony stimulating factor to make more white blood cells. For the process of making blood to work, it is necessary for the body to have the building blocks of the components of blood. The first and most important, water and salts. Most importantly, you need salt, water and trace minerals as the basis of a natural cure for anemia. Some forms of anemia may be made worse by dehydration. Consider how the blood is made. Not only is it manufactured, the hormones that tell the stem cells also need to be made by the body. Making all of these requires salt and water (called fluid and electrolytes in health care). If there is not enough of either, the body will not be able to produce what is needed. Science has shown that the oral version of a saline IV is not only safer, it works better. We call this the Water Cures Protocol. To work, it is essential to use unprocessed salt as it has over 80 trace minerals we need for our body to function at its best. The Water Cures Protocol should be the foundation of your personal program to increase your blood count. It is the first step to helping your body help itself. Next, proteins and iron are necessary. The chew-able vitamin C works just fine and may work better than the more expensive kinds of C.
B 6, B 9, B 12 (the doc's generally just gave the three). Food grade zinc 30 mg daily. One study found that zinc alone could increase or decrease the blood count, depending on the biology of the person taking it. However, when taking it with the iron, there was an increase in blood count. You can get zinc from foods such as red meat, shellfish (oysters are the best), legumes and nuts. Dietary iron can also come from meat and some green leafy vegetables, beets, artichokes, potatoes, dried beans (black eye peas) and peas, nuts and seeds. These also provide the necessary dietary potassium we need. While low magnesium is considered rare in anemia, it should be noted that it is rarely considered. Even if it was considered, usually an inferior magnesium test was used. Interestingly, using this less effective test, one study found that over half of the population is low in magnesium. No wonder since the American diet provides less than 10 percent of the magnesium we need. Most cardiologists do not look at the right test. The magnesium level can look normal even though your levels are in the danger zone. Not enough magnesium and you could have a heart attack, even though your magnesium levels were normal. Your doctor needs to order the RBC Magnesium or the Erythrocyte Magnesium to get the true picture of what is going on. From the universe of natural treatments we found a simple, easy way to increase your magnesium levels. You can make a concentrate and just add a little to your drinking water every time you drink. No ills, bills or pills for this one. Diabetic Medications: Glyburide, (Micronase, Glipizide (Glucotrol), Diabeta Glynase ). Magnesium supplementation may cause your blood sugar to decrease. With a low blood sugar you may experience tremors (shaking), hunger, nervousness, sweating, headache, tiredness, heartbeat skips, confusion, and vision problems. Doctors may use magnesium to help lower the dosage of certain diabetic medications. Only take mag supplementation under a doctors supervision if you are currently under a doctors care. Neurontin: May result in decreased absorption of both the magnesium as well as the neurontin. Doxycycline: Magnesium may cause the doxycycline to be less effective. It is probably best to take the magnesium at least 3 hours before or after the doxy. Note: you should never take Doxycycline after it has expired or you may have serious consequences. Minocycline: May cause it not to work as well. Take it 1-3 hours before or after. Tetracycline Hydrochloride: May cause it to be less effective. Take the magnesium 1-3 hours before or after the drug. The magnesium bicarbonate water recipe could make drugs you are on work either better or worse, resulting in unfavorable outcomes. If there is no reason you cannot take it, then here is the recipe. You will need three things. Look for MOM that has no flavoring and no ingredients, only purified water. It should be listed under inactive ingredients. While MOM may be found in different strengths, try to get the one that has 400 mg per teaspoon (5 ml). This will result in in 1 tablespoon (1 TBS = 15 ml), 500 mg of Mg of magnesium. You will be using a total of 1500 mg to make the 1 liter bottle. 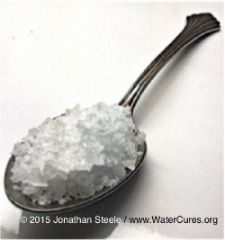 The magnesium bicarbonate water recipe requires unflavored carbonated water or club soda. Examples include Schweppes Club Soda and Canada Dry Seltzer. It will only have water and carbon dioxide. The club soda has a small amount of sodium. The third thing we recommend is a glass jars or bottles for drinking from. Ideally, get 5 glass bottles in a size that total the amount of water you need daily. If you break the number down, you need about 10% your body weight in ounces of water each time you drink. Total daily water intake will be 1/2 your body weight in ounces of water (then divide by 5 for your individual amount of water you need to drink each time). Chill the carbonated water for at least 1 hour in the fridge. Shake the MOM vigorously. In the cup that comes with the MOM bottle, measure out 3 TBSP - 45 ml. Take the bottle of carbonated water out of the fridge and remove the cap. Pour the 3 TBSP - 45 ml of MOM into the 1 liter bottle and then replace the cap. Shake the bottle with the MOM and the soda water well. Shake it for about 15 to 30 seconds. You will note the soda bottle will turn cloudy as part of the process. Put it back in the refrigerator. In 30 minutes it can be shaken again. There will be a slight amount of MOM at the bottom and it will mix and disappear. The bottle may become cloudy for a short time once again. Shake for 15 to 30 seconds. No need to worry about a soda explosion. By this time you will note the bottle to cave in slightly. You now have dissolved (ionized) magnesium hydroxide and bicarbonate water, aka magnesium bicarbonate. In a 16 ounce bottle of water add two ounces of the concentrate. Your drinkable magnesium bicarbonate recipe yields about 125 mg of magnesium per liter. In a 16 ounce bottle, you will get about 64 mg of magnesium and 630 mg of magnesium bicarbonate. If you are eating at least 50% of your diet as raw foods, the mag bicarb concentrate you add to your water will help you get adequate magnesium. According to the research, in addition to being part of the natural cures for anemia, this will help end headaches, muscle cramps, high blood pressure, pseud gout pain, and even restless leg syndrome. You may wonder, if this is so good, how come my doctor has not told me? Increasing Glutathione: One study found, while not looking for this, that increasing glutathione also increased blood counts. In a number of people dealing with various kinds of anemia, teaching them how to increase their glutathione made it possible to raise their blood counts. In one case, the patient went from a hgb of 9 to 14 inside of one month. It usually takes the blood stem cells at least 2 weeks to mature into the kind of blood cells that are needed. If there is enough lead time, this would be one of the better ways of increasing the blood count. While not a typical use, there is considerable science to show that this could be used with the above natural remedies for anemia to increase blood counts. Always ask your doctor or pharmacist if this can be taken with your current medications.